Marie - Luise - porcelain collection in white or white / gold for elegant hotels and restaurants. Marie - Luise - dinner service for sophisticated table culture. Marie Luise in pure white, white / gold or white / platinum - a stylish and very elegant porcelain collection in 3 decor variants. Their characteristic and distinctive shape of the cups, jugs and all other parts gives the line that typical aristocratic style. The lightness of the décor and the fine hand-painted gold rim / platinum rim, which is dishwasher-safe by the way, make the noble porcelain pieces by no means look old-fashioned. Whether an elegant round table, a business breakfast with your best customers, a garden party, a reception or the daily coffee break in the office - Marie - Luise accompanies you confidently and reliably at every event! 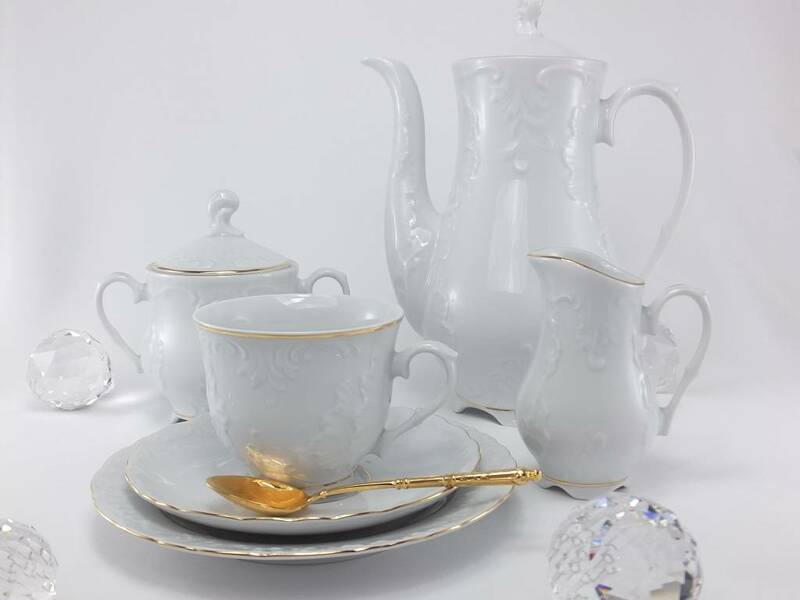 All 3 variants of this porcelain collection are made to order with the waiting time about 6 weeks and it is partly manual work (handle and foot of the cup are manually attached). The glaze and gold rim / platinum rim are also applied manually. Matching accessories - cake plates, flower vase, candle holder, napkin holder, pepper / salt shaker, serving plates, napkin rings, egg cups, butter dish and more. Your personal contact with us is always advisable under +49 89 31883666 to make you the desired offer.